Lancing is an essential part of successful diabetes management for many diabetics. Lancets are the small, sharp objects that are used to prick the skin. This piercing of the skin allows you to draw a small drop of blood to the surface in order to test blood glucose levels using a blood glucose monitor and blood glucose test strips. Although some diabetics prick themselves with a lancet, most prefer to use a special lancing device. Lancing devices are designed to firmly grip the lancet, and are operated by simply clicking a button. Depending on how thick-skinned the patient is, different settings may be required. Lancets are designed to only be used once, and then disposed of in a safe way. Using a lancet just once will make it more blunt, and therefore more painful to use. There are a variety of ways of getting rid of used lancets safely as they can carry infection. Some companies sell sharps boxes, and GPs can even prescribe sharps bins to dispose of lancets safely. A Diabetes UK initiative called on all professionals to work together to ensure lancet disposal was made easier. There are a variety of different lancets and lancing devices on the market, not all of which fit together. Some companies make universal lancing devices, but this is not the case for every manufacturer. In some doctors’ surgeries, professional lancing devices can be used by many patients. Are all lancets the same size? Lancets vary considerably in size, some are smaller and therefore more appropriate for children. These same lancets may not draw an appropriate amount of blood for adults. Do some lancets hurt more than others? Some companies claim that their lancet or lancing device is less painful to use, but this isn’t necessarily always the case. The EasyTouch lancing device comes with most Abbott meters and uses Abbott Thin Lancets. Microlet from Bayer are lancing devices that are easy to use. 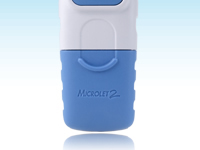 The Microlet can be can be bought online from Bayer for around £7.50. The OneTouch Delica from LifeScan is designed to be kind to fingers, featuring seven depth settings to choose from and Advanced Glide Control System. Sterilance Press variations include the Vitrex Sterilance Lite which is sterilised using gamma radiation.